Axillary nerve injury is characterised by trauma to the axillary nerve: from either a compressive force or a traction injury following anterior dislocation of the shoulder. Axillary nerve injury referred to neuropathy of the axillary nerve. It describes a loss of movement and/or lack of sensation in the shoulder area of the body. Stress or damage to the axillary nerve, which serves the deltoid muscles and skin of the shoulder, causes this dysfunction. Since this is a problem with just one nerve, it is a type of Peripheral neuropathy called mononeuropathy. Of all brachial plexus injuries, axillary nerve palsy represents only 3% to 6% of them. Anterior shoulder dislocation is the most common occurring dislocation at the shoulder. Figure 1- Depiction of the axillary nerve stretched across the humeral head during dislocation. Adapted from Apaydin et al. The axillary nerve becomes stretched across the humerus as it dislocates anteriorly and inferiorly. Propagated tension due to overstretching of the axillary nerve over the humeral head during shoulder dislocations may cause elongation of the free portion of the axillary nerve and the increased tension may even result in axillary nerve avulsions from the posterior cord of brachial plexus. The axillary nerve is susceptible to injury at several sites, including the origin of the nerve from the posterior cord, the anterior inferior aspect of the subscapularis muscle and shoulder capsule, the quadrilateral space, and within the subfascial surface of the deltoid muscle. Figure 2- Axillary nerve within the quadrilateral space. Adapted from Vitanzo et al. It is important to note that the clinical presentation of axillary nerve dysfunction is variable and can go undetected, as the concomitant dislocation or fracture may mask the symptoms. Nerve injury should be considered as part of the differential diagnosis process when a patient reports pain, weakness, or paresthesias. The “Unhappy Triad” consists of a shoulder dislocation that results in both a rotator cuff tear and axillary nerve injury. QSS is an “uncommon condition that involves the compression of the posterior humeral circumflex artery and the axillary nerve within the quadrilateral space,” secondary to an acute trauma or from overuse, especially with overhead sports like throwing and swimming. PTS is an uncommon, idiopathic condition, characterized by an acute onset of intense pain, without a mechanism of injury, that subsides within days-weeks, leaving behind residual weakness/paralysis in upper extremity muscles. Symptoms are NOT related to neck movements. Physical examination should begin with a screening consisting of an evaluation of the head and neck which shouldn’t reveal any abnormalities. If the patient presents with a recent shoulder dislocation, presence of a radial pulse and sensation and movement of the digits should also be assessed as part of the initial screening. 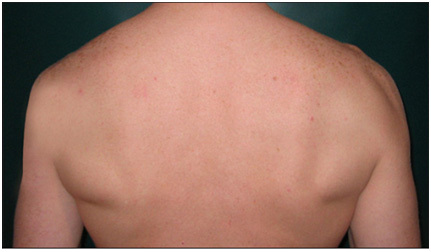 Figure 4- Picture of significant atrophy to the left deltoid and mild atrophy to the teres minor. Adapted from Vitanzo et al. Figure 5- Extension Lag Sign: Elevate the patient's arm to near full extension. Ask the patient to actively maintain that position. A (+) test is if the patient's arm drops. Adapted from Hertel et al. Accurate manual muscle testing is necessary as 60% of athletes may be able to elevate the effected arm by compensating with and recruiting the pectoralis major and supraspinatus muscle groups, and prevent subluxation by utilizing the supraspinatus and long head of the biceps muscles. However, there is no evidence to translate this statistic to the general population. The best means to confirm a concomitant axillary nerve injury with shoulder dislocation includes detailed subjective and objective clinical examinations, along with electromyogram (EMG) studies. 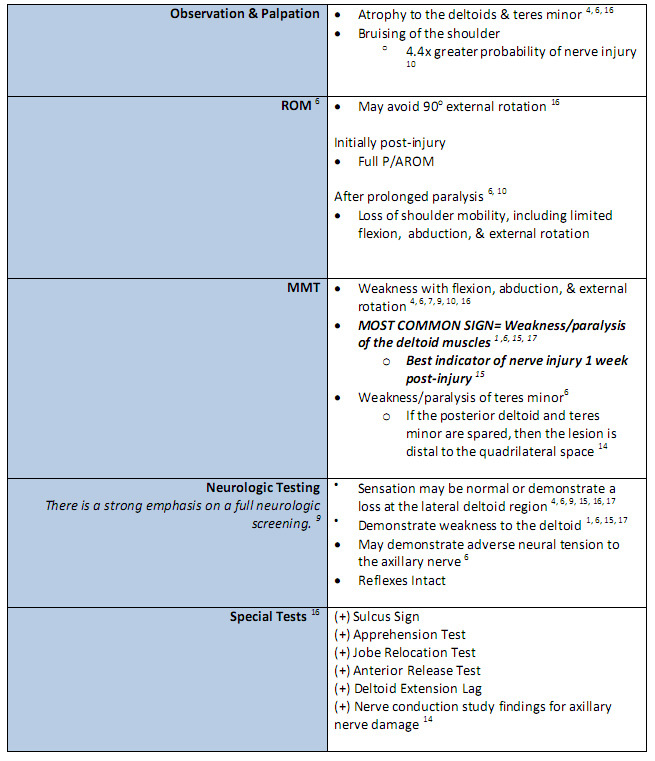 The diagnostic test of choice to identify nerve conduction loss is EMG However, significant nerve damage may not be identified until 2-3 weeks post-injury. EMG can distinguish between atrophy secondary to pain or that of nerve injury. EMG studies also serve as means to track the patient’s progression or regression throughout the recovery phase, ultimately indicating whether a surgical or conservative treatment approach is needed. Full recovery occurs 85% to 100% of the time with conservative management within 6 to 12 months. Muscle weakness due to the axillary nerve lesion may recover spontaneously as the tissues from the shoulder dislocation heal. MRI is rarely used for initial evaluation of a typical nerve injury. It may be useful if the diagnosis is unclear or if there is evidence of abnormal recovery. A normal MRI does not rule out nerve injury. The duration of recovery from axillary nerve injury is prolonged, lasting as long as up to 35 weeks. 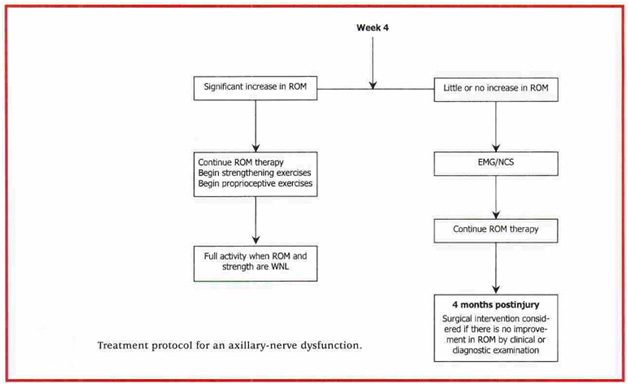 There is uncertainty among clinicians as to the appropriate time for surgical exploration following isolated axillary nerve injury, with some authors recommending exploration at 3 months post-injury while others recommend at 6 to 12 months post-injury. The site of the axillary nerve injury is variable, making both anterior and/or posterior surgical approaches appropriate. 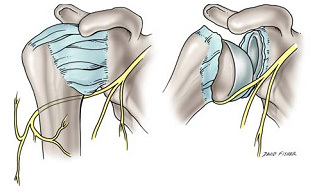 If the axillary nerve cannot be repaired without tension, cable grafts are required. Indications for surgery are rare but must be understood by clinicians in order to maximize outcomes and minimize complications. Suspicion of osteophyte formation or compression in the quadrilateral space. No axillary nerve recovery observed by 3 to 4 months following injury. No improvements were seen after 3 to 6 months of conservative treatment. No EMG/NCV evidence of recovery by 3 to 6 months after injury. Surgery for shoulder instability in young active patients reduces the likelihood of recurrent anterior shoulder dislocations, therefore reducing the possibility of axillary nerve compromise. Current research encompassing treatment and intervention of axillary nerve injuries following shoulder dislocation is limited. The research suggests that the management of the axillary nerve damage following shoulder dislocation is treated in the same manner as treating an isolated dislocation, with an emphasis on strengthening and stimulation of the deltoids and teres minor muscles.There should be a great amount of importance placed on allowing ligamentous, capsular, and nervous tissues time to heal while preventing joint stiffness, which could ultimately hinder function greater in the long run. Avoid end-range ER/Abd until later stages of treatment! PRECAUTION: against shoulder abduction & flexion beyond 90 degrees, and ER beyond neutral in the first 3 weeks. Conservative physical therapy treatment can last between 3 to 6 months. It is essential that the physical therapist continuously monitor the progression of axillary nerve reinnervation during treatment and contact the patient’s physician if there are no signs of improvement between 3 to 4 months. Note: Progression of these interventions with increased weight or resistance should be based on each individual patient and their level of pain and perceived joint stability throughout a controlled movement. 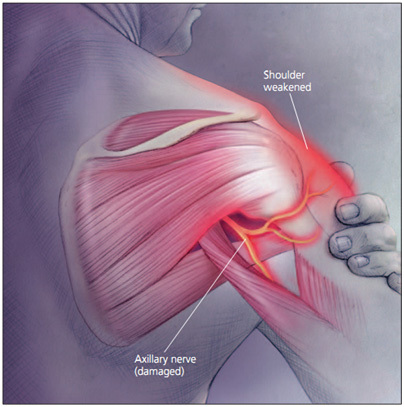 Figure 7- Clinical decision-making with axillary nerve injuries. Adapted from Allen et al. For examples of therapeutic exercises, see Examples of Therapeutic Exercises in Axillary Nerve Injury Rehabilitation. A standardized treatment is not yet known for patients with axillary nerve injury secondary to shoulder dislocation. However, immobilization based on age, treatments focused on ROM, strength, neuromuscular re-education, and function all seem to be a recurrent theme. With early detection, prognosis for the injured axillary nerve is good due to its short length needed to regenerate. ↑ 1.0 1.1 1.2 1.3 1.4 1.5 1.6 Allen J, Dean K. Recognizing, managing, and testing an axillary- nerve dysfunction. Athletic Therapy Today. 2002;7(2):28-29. ↑ 2.0 2.1 2.2 2.3 2.4 2.5 2.6 2.7 2.8 Apaydin N, Tubbs S, Loukas M, Duparc F. Review of the surgical anatomy of the axillary nerve and the anatomic basis of its iatrogenic and traumatic injury. Springer. 2010;32:193-201. ↑ 3.0 3.1 3.2 3.3 Cutts S, Prempeh M, Drew S. Anterior shoulder dislocation. Ann R Coll Surg Engl. 2009:91:2-7. ↑ 4.00 4.01 4.02 4.03 4.04 4.05 4.06 4.07 4.08 4.09 4.10 4.11 4.12 4.13 4.14 4.15 4.16 4.17 Duralde X. Neurologic injuries in the athlete’s shoulder. Journal of Athletic Training. 2000;35(3):316-328. ↑ 5.0 5.1 5.2 Handoll HHG, Hanchard NCA, Goodchild LM, Feary J. Conservative management following closed reduction of traumatic ; anterior dislocation of the shoulder (review). Cochrane Database of Systematic Review. 2006;1:1-26. ↑ 6.00 6.01 6.02 6.03 6.04 6.05 6.06 6.07 6.08 6.09 6.10 6.11 6.12 6.13 Miller T. Peripheral nerve injuries at the shoulder. The Journal of Manipulative Therapy. 1998;6(4)170-183. ↑ 7.0 7.1 7.2 7.3 7.4 7.5 7.6 7.7 Payne M, Doherty T, Sequeira K, Miller T. Peripheral nerve injury associated with shoulder trauma: a retrospective study and review of literature. Journal of Clinical Neuromuscular Disease. 2002; 4(1): 1-6. ↑ 8.00 8.01 8.02 8.03 8.04 8.05 8.06 8.07 8.08 8.09 8.10 8.11 8.12 8.13 8.14 8.15 8.16 8.17 8.18 8.19 8.20 8.21 8.22 8.23 8.24 Perlmutter G, Apruzzese W. Axillary nerve injuries in contact sports: recommendations for treatment and rehabilitation. Sports Med. 1998;26(5): 351-360. ↑ Cox C, Kuhn J. Operatice versus nonoperative treatment of acute shoulder dislocation in the athlete. Current Sports Medicine Reports. 2008;7(5): 263-268. ↑ McFarland E, Caicedo J, Kim T, Banchasuek P. Axillary nerve injury in anterior shoulder reconstructions: use of a subscapularis muscle- splitting technique and a review of the literature. Am J Sports Med. 2002;30:601-606. ↑ 11.00 11.01 11.02 11.03 11.04 11.05 11.06 11.07 11.08 11.09 11.10 Visser C, Coene L, Brand R, Tavy D. The incidence of nerve injury in anterior dislocation of the shoulder and its influence on functional recovery a prospective clinical and emg study. Journal of Bone and Joint Surgery. British volume. 1999; 81-B(4). 679-685. ↑ 12.00 12.01 12.02 12.03 12.04 12.05 12.06 12.07 12.08 12.09 12.10 Kazemi M. Acute traumatic anterior glenohumeral dislocation complicated by axillary nerve damage: a case report. Journal of the Canadian Chiropractic Association. 1998;42(3):150-155. ↑ 13.00 13.01 13.02 13.03 13.04 13.05 13.06 13.07 13.08 13.09 13.10 Safran M. Nerve injury about the shoulder in athletes, Part 1: Suprascapular nerve and axillary nerve. Am J Sports Med . 2004;32(3):803-819. ↑ 14.00 14.01 14.02 14.03 14.04 14.05 14.06 14.07 14.08 14.09 14.10 14.11 14.12 Neal S, Fields K. Peripheral nerve entrapment and injury in the upper extremity. American Family Physician. 2010; 81(2): 147-155. ↑ 15.0 15.1 15.2 15.3 15.4 15.5 15.6 15.7 15.8 15.9 Vitanzo P, Kenneally B. Diagnosis of isolated axillary neuropathy in athletes:case studies. The Journal of Musculoskeletal Medicine. 2009; 26:307-311. ↑ 16.0 16.1 16.2 16.3 16.4 16.5 16.6 16.7 16.8 16.9 Miller T. Axillary neuropathy following traumatic dislocation of the shoulder: a case study. The Journal of Manual & Manipulative Therapy. 1998;6(4):184-185. ↑ 17.0 17.1 17.2 17.3 17.4 17.5 17.6 17.7 17.8 Manske R, Sumler A, Runge J. Quadrilateral space syndrome. Humen Kinetics-ATTI.2009;14(2):45-47. ↑ Mamula C, Erhard R, Piva S. Cervical radiculopathy or parsonage-turner syndrome: differential diagnosis of a patient with neck and upper extremity symptoms. Journal of Orthopaedic Sports Physical Therapy. 2005; 55(10): 659-664. ↑ Hertel R, Lambert SM, Ballmer FT. The deltoid extension lag sign for diagnosis and grading of axillary nerve palsy. J Shoulder & Elbow Surgery 1998;7(1):97-108. ↑ Apprehension Test [Video]. YouTube. http://www.youtube.com/watch?v=gLBX8vUnCo0. Published June 2, 2007. Accessed November 28, 2010. ↑ 22.0 22.1 22.2 22.3 22.4 Handoll HHG, Al-Maiyah MA. Surgical versus non-surgical treatment for acute anterior shoulder dislocation.Cochrane Database of Systematic Review. 2004;1:1-37. ↑ 23.0 23.1 23.2 23.3 23.4 23.5 Deyle G, Nagel K. Prolonged immobilization in abduction and neutral rotation for a first-episode anterior shoulder dislocation. Journal of orthopedic sports physical therapy. 2007; 37(4): 192-198. ↑ 25.0 25.1 Robinson M, Howes J, Murdoch H, Will E. Graham C. After primary traumatic anterior shoulder dislocation in young patients. The Journal of Bone Surgery. 2006;88(11): 2326-2336. ↑ 26.0 26.1 Mahaffey B, Smith P. Shoulder instability in young athletes. American Family Physician. 1999;59(10): 2773-2782.